The Copenhagen police arrested eight people during a demonstration organised by the anti-Islamic movement PEGIDA on Monday. Two persons were arrested for attacking police officers on duty. One of them spat at a police officer, while the other offender reportedly struck another police officer on the neck. Five other persons were arrested after a brawl on a train, while the last detainee was accused of disturbing law and order. No details such as the gender and age of the detainees were made public. According to the police, PEGIDA organises demonstrations in Copenhagen every Monday. PEGIDA stands for Patriotic Europeans against the Islamisation of the West. It is a German far right, anti-Islam, political organisation founded in Dresden in October 2014. 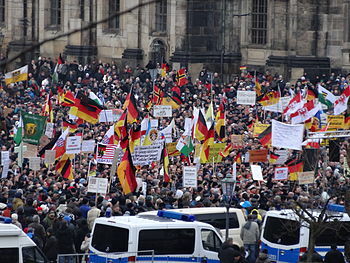 Since then, it has been organising regular protests against Islam and Muslim immigration in Germany. The movement has gained sympathy among like-minded people in other countries, including Denmark, the UK, Norway and Austria.